An urban-suburban mashup where a blend of 20th century tradition and 21st century millennial-induced weirdness creates the glorious Oklahoma oddity known as Tulsa. Ten years ago, standing at the intersection of 5th and Boston at six o’clock in the evening would put you in the middle of an Art Deco ghost town. 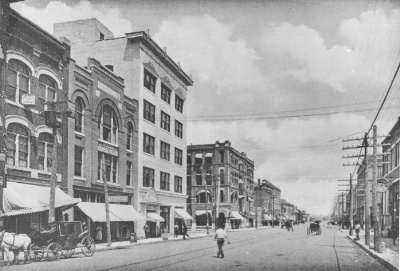 A walk through the Brady District (now known as the Brady Arts District) would be sketchy at best. Ask just about anyone in the country at the time and they would have had a hard time pointing out Tulsa on a U.S. map. Today, it’s a different story. Tulsa is currently in the midst of an urban boom—the greatest the city has experienced since the oil boom of the early 20th century. The city transforms daily with the growth of new businesses, swanky downtown dwelling spaces, outdoor gathering spaces, and A&E venues. Yet even in the midst of the rising buildings, the greatest boom remains unseen: an undeniable vibe of excitement. People are starting to realize that Tulsa is a pretty amazing place to live, work, and play. It’s a sentiment not only shared among long-time residents—the rest of the country is taking notice as well. Suddenly, the vocabulary surrounding Tulsa isn’t solely about the Bible Belt, barbeque, Bob Wills, and tornadoes—it’s about development, innovation, technology, and talent. There’s a realization that a conversation about innovation hubs and startup companies isn’t just reserved for Silicon Valley and Austin—Tulsa has the chops to compete with the kids in the business development schoolyard too. 2016 is a great time to be in Tulsa...and that’s exactly why FreeForm is here. At FreeForm, our success runs parallel to the success of the city we hail from. While other startup companies looked to the West Coast and East Coast to seek an identity, we looked no further than our own Boomtown...and elected to create our own boom. Since FreeForm launched in 2012, we have transformed the foundation of a lightbulb moment into a company rich in experience, relationships, and achievements. In tandem with Tulsa, we have grown and helped to transform perceptions of Oklahoma on a national scale. It’s an accomplishment we draw inspiration from each day and it is one that is now visible to the rest of the country as well. 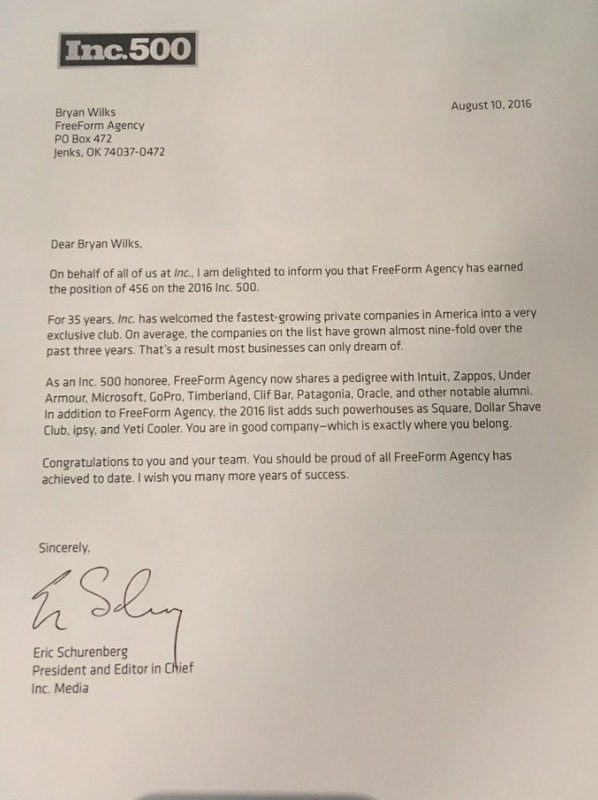 On August 10th, FreeForm was honored to learn that we had ranked number 456 on the Inc. 500 list of fastest-growing private companies in the United States. If this wasn’t enough to knock our socks off (which it was), we also learned that we were named number two on the list of top Oklahoma companies. FreeForm. Number two in Oklahoma. This is awesome. When it comes to the technicalities of how we made the list, the determination was solely based on growth. Inc. 500 rankings are based on a company’s revenue growth percentage attained during the previous three years prior to application. FreeForm achieved an incredible 845 percent growth since 2012, with business already on track to triple in 2016. What the rankings did not take into account was the 2:30 a.m. E-mail threads, the thousands of cups of coffee, the arsenal of bad puns at meetings, the number of times we promised significant others, “just one more hour,” the number crunching, the Eureka moments, the triumphs, the setbacks, and the joy: all of the reasons and experiences that make what we do the greatest job that we could ever imagine. This is Boomtown. This is FreeForm. We have grown and we are growing. Our story was written by you and to you we give our endless thanks for this honor.